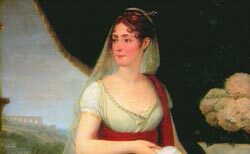 In 1806 Josephine accompanied Napoleon on the Prussian Campaign, but a dark cloud was looming on the horizon: left behind in France was his latest mistress, Eleonore Denuelle, who was pregnant with his child. Until this time Napoleon had thought Josephines barrenness during their marriage might be his fault, but the birth of his son to Eleonore Denuelle changed everything. While he still loved Josephine, he began to think very seriously again about the possibility of divorce. CHEVALLIER: Their greatest quarrels were jealousy, because Josephine was extremely jealous. She knew that she couldnt have any children and I think she learned that very early and she tried to make Napoleon believe that he couldnt have any. She said, "Ive already had two, you havent had any," so she tried to make him believe that, but she knew there was a threat hanging over her head because if she were to be divorced, then she would have lost everything shed attained. And Napoleon had flirts as it were with women around him, but she was so jealous that sometimes she would spy on the emperor and go up back staircases and listen at the doors. This is something which made their life very difficult because Napoleon couldnt stand having her watching over his shoulder whenever he had an adventure with another woman. HORNE: There's a famous rather poignant exchange between him and Josephine in 1808, when he's getting involved in Spain and she says, "Why on Earth do you want to go on fighting battles?" And he says, "Because I am a victim of history. I have no option." 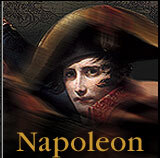 The final die was cast when Josephines grandson Napoleon, who had been declared Napoleons heir, died of croup in 1807. Napoleon began to create lists of eligible princesses. At dinner on November 30, 1809, he let Josephine know that  in the interest of France  he must find a wife who could produce an heir. From the next room, Napoleons secretary heard the screams. "No, I can never survive it!" Josephine cried, and collapsed. The following day servants took her possessions to Malmaison, which was to remain her home. She continued to make public appearances as Empress, but the impending divorce was common knowledge. The divorce ceremony was a grand but solemn social occasion, and each read a statement of devotion to the other.